Paul Krugman gets 1200 or more comments to his opinion pieces. First of all, that's great to see. That is a celebration of free speech, political discourse, and the power of the Internet to be the modern day coffee house. Second of all, I'll be the first one to acknowledge that no author, no matter who they are, can really do justice to 1200 comments on each piece they write. In my post the other day, I said that authors need to tend to their comment threads. I still feel that way, but at scale, Krugman scale, they need help. Some of that help can come from interns and entry level employees who can wade through all of the comments using a moderation tool like the one Disqus will be rolling out shortly for publishers. The comment system itself should leverage community interaction to surface the best comments. Then the author can get delivered to them the best comments, via email, the web, or some other method, to respond, if they so desire. There were several comments to my post the other day on this topic that said something like "you have no idea what newspapers and journalists have to deal with every day in their jobs". That's true. And this 1200 comments thing drives that point home. 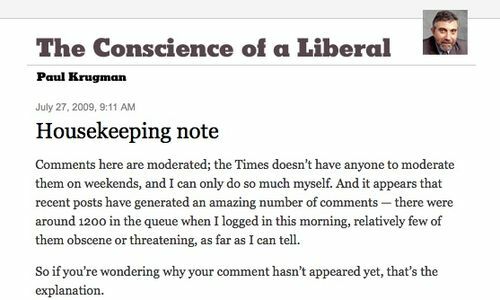 But even so, I stand by my assertion that tending to a comment thread can be done, even at Krugman scale. It takes technology, community, some internal support resources, and a committment to make it part of the experience. It looks like the NY Times and Paul Krugman are working on it. That's great to see.